The Birthmachine is H.R. Giger's artistic manifestation of his belief that the greatest threat to our civilization is the approaching overpopulation of the planet. 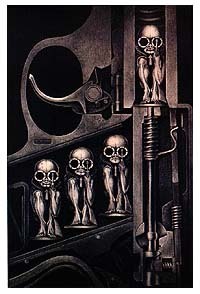 The inspiration for the Birthmachine sculpture and the 'Bullet Babies' is the 1967 pen and ink Giger artwork "Birthmachine", a cut-away image of a fully loaded Walther pistol. 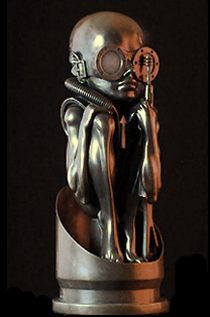 Available for adoption in either bronze or aluminum, the limited edition Birthmachine Baby sculptures sit inside the shell of a 9mm Luger casing. The bottom surface of the sculpture is finished to look like a real bullet and is marked '9MM GIGER', along with the artist's signature and the edition number. CALL TO PLACE AN ORDER. Do not attempt to order the Birthmachine Baby through the webstore. Prior communication and written confirmation is required via email. You will be requested to make the 50% deposit directly to the foundry. Our foundry, one of the best in the world, is located in Upstate New York in the USA. If you live in New York sculptures may be picked up to avoid the additional charges for crating & Shipping. The price of other high priced limited edition sculptures are available on request. *Please note that allsculptures are cast to order. As the shop needs aquantity number, it states that we have the items in stock. That is NOTthe case for ANY of the sculptures, so please allow us for the longershipping time. Brass with acid bath patina, 5” x 6.5” inches Sterling silver 2.5” inch tattoo machine Biomec..
Nickel bronze 6.5" x 3.7" x 2.1" inches Signed & numbered in cast Edition of 500 For more de.. Bronze (black) 4" x 6.5" x 3" plus stand with mount Signed in bronze Open numbered edition *P..
Birthmachine Baby, 1998 Limited Edition of 23 in Aluminum 23" x 9" (58 x 23 cm) ..
Birthmachine Baby, 1998Limited Edition of 23Bronze with gun-metal grey patina23" x 9" (58 x 23 cm)	T..